The Ware for May, 2005 is shown below. Click on the image for a much larger view. This particular specimen runs a real risk of being guessed outright through simple familiarity. As usual, just getting the answer right won’t necessarily get you a prize. The most correct entry with the most interesting/insightful commentary or story relevant to the subject will win the prize! This entry was posted on Thursday, May 12th, 2005 at 4:03 am and is filed under Hacking. You can follow any responses to this entry through the RSS 2.0 feed. Both comments and pings are currently closed. Neat “contest.” :) I’m going to guess it’s a Tandy Model 100 portable. What makes you think that’s what it is? The visible features, mostly. 4 ‘AA’ cells, the 8085, a modem jack, a parallel port and/or DB-25 serial-ish looking connector. Date codes on the chips are right on-target (c. 1983) for the Model 100. 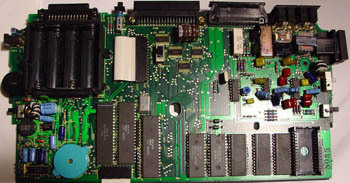 The PC board is of fairly low-grade construction (note the breakaway tabs at the edges) typical of Radio Shack gear of that era. Looks like a nifty little portable platform of some kind — if not a model 100, then I’d bet it’s something similar/competitive. Nice site, btw! Wish I had this kind of time/creative energy for my own. looks like a Commodore Computer. I got one in the corner here, damn if they arent neat. beats atari, nintendo and any other gaming device of that time. (i use an old Sega genesis controller to play it instead of an joystick, i hate those things) Too bad they went bankrupt. uhhh well, what makes me think that is it… First thought in my head… i guess. and pretty much what he (John) said… but put in Commodore instead of Tandy…. no offense John, You know your stuff. Plus Bunnie, I want to know something that has always been on my mind… (No racial pokes or offenses meant here) But why are Asian people smarter in technology? and smarter in most other high education fields… I have an Chinese friend around here where I am from. And I be damned if he isnt one of the smartest people i have met. He once designed an .gif (this is back in the day, we where around 15 years old) from scratch. put it on his site, and was like “no big deal. i do it all the time” well i have rambled, you’ll prolly delete this, but at 3:23am and been up all night and day and worked, cutting pizzas in an 100 degree enviroment plays on ones mind. but anyways, Commodore? Shoot. John Miles already got the solution. That is definately a model 100. I noted the 8085, the 2K x 8bit sram, and the RS232 trasciever. The IC with the ‘c1983 Microsoft’ embossed on it was probably a BASIC rom. So all I had to do was to find a list of computers that used the 8085. From there I could look them up on Google Image Search. As you can see from the images on the computing museum below, the location of the battery case, power switches, and comunications ports all line up perfectly with the picture of the board. Man, all of the sudden I have strong desire to grab one off ebay…. Oh yeah, the piezo electric buzzer was also a give away that it was an old school personal computer. And it’s actually a model 102 it turns out. The crystal is 4.9125 mhz, while the model 100 had a ~2.5 mhz clock. I found this out when I got curious and downloaded an emulator called ‘VirtualT’. then thinking “MSX”, but MSX machines ran a Z80. that the 102 used surface mount. some modern 4 AA machines I have worked on. They walk through the machine, subsystem by subsystem.